With its rounded Gothic-arch roof, the Beamer Barn dominates this small farmstead that sits along Interstate 70 in the far northwest corner of Gove County. 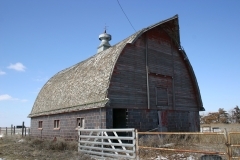 Arch-roof barns, which were designed to maximize hay storage, gained popularity in the late 1910s but are increasingly rare on the modern Kansas landscape. The first story of the Beamer Barn, which was constructed in 1924, features hard-fired ceramic blocks that rest upon a concrete foundation. The second story is wood framed, with horizontal weatherboards within the arched ends and a wood-shingle roof with a graceful Gothic arch. On the east-facing elevation there is a haymow at the roof peak and a large sliding hay door on the second story. Its rafters are constructed of bent round rafters that are four and five boards thick. Horizontal beams near the interior peak provide bracing, as do several spaced vertical beams. Today, the barn is vacant and no longer used as part of a working farm, however, it retains its historic interior features including the central aisle, stanchions, and upper story hayloft. 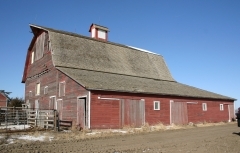 It was nominated as part of the "Historic Agriculture-Related Resources of Kansas" multiple property listing for its association with local agricultural history and for its architecture. Benson Culvert is a double arch limestone bridge that was built in 1938 as a Works Progress Administration (WPA) project. The bridge’s construction is typical of limestone structures built in this area during the early 20th century and is representative of the master stone builders and craftsmanship of construction workers trained by the WPA. In September 1937, County Engineer Frank Tyson announced an "extensive culvert campaign" and the use of WPA workers to quarry local rock and construct several similar bridges. The Benson Culvert - likely so called because it was near Charley Benson’s property - was opened to traffic in June 1938. It is located southwest of Gove on a rural county road near the intersection of M Road and 28 Road. It spans a tributary of Plum Creek and water flows beneath the bridge only during seasonal rains. 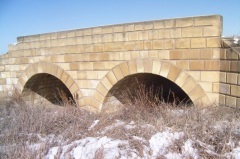 It was nominated as part of the New Deal-era Resources of Kansas and Masonry Arch Bridges of Kansas multiple property nominations for its local significance in the areas of social history, government, and architecture. Located on Main Street in Quinter, the D. D. Ikenberry Building was built in 1908. It is a two-story brick commercial building with an original first-story storefront. Decorative brickwork enhances the front façade and contributes to the walls that are four bricks thick. 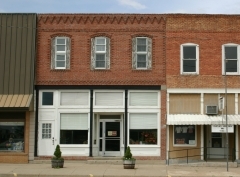 The building is named for its owner who moved his mercantile business, "The Big Store", into the building in May 1908. It was nominated for its association with local commerce and its architectural significance. Constructed in 1887, the Grainfield Opera House was built as a symbol of permanence. Grainfield was laid out as a town by the Union Pacific Railroad in 1879 and by 1887 its population had increased by a third. In March of 1887, the Grainfield Town Company was established and assumed ownership of the town from the Railroad. In May of the same year, construction on the Opera House began and by October was complete. 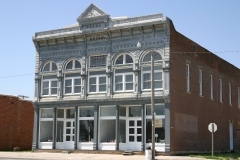 It is a two-story brick commercial building with an ornate cast iron front. The Mesker Brothers of St. Louis, Missouri manufactured the decorative iron front and is the only element not locally made. The building was nominated for its association with local commercial history. Jenkins Culvert is a triple arch limestone bridge that was built in 1938 as a Works Progress Administration (WPA) project. The bridge's construction is typical of limestone structures built in this area during the early 20th century and is representative of the master stone builders and craftsmanship of construction workers trained by the WPA. In September 1937, County Engineer Frank Tyson announced an "extensive culvert campaign" and the use of WPA workers to quarry local rock and construct several similar bridges. The Jenkins Culvert - likely so called because it was near Harley Jenkins’s property - was opened to traffic on January 23, 1938. It is located southwest of Gove on a rural county road near the intersection of M Road and 22 Road. It spans a tributary of Plum Creek and water flows beneath the bridge only during seasonal rains. 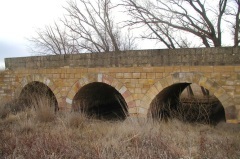 It was nominated as part of the New Deal-era Resources of Kansas and Masonry Arch Bridges of Kansas multiple property nominations for its local significance in the areas of social history, government, and architecture. Built by farmer Frank Oxley in 1911, the barn and surrounding property were sold to local auctioneer, farmer, and politician Joseph Flora in 1916. Beginning in 1931, Flora held livestock and merchandise sales at the barn, which attracted buyers from throughout the region, thus providing a strong market for local farmers and stockmen. The barn is nominated for its association with Flora and for its architectural significance as an early 20th century gambrel-roof livestock barn.